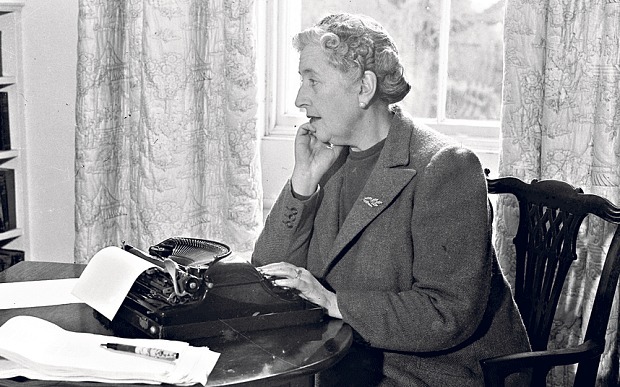 I have been in love with the Golden Age of Crime Fiction for decades. I’ve also been a big fan of the great movies of the 1930s for about as long. Add to that my enjoyment of humorous wordplay, mix it all together, and you get The Drew Farthering Mysteries. 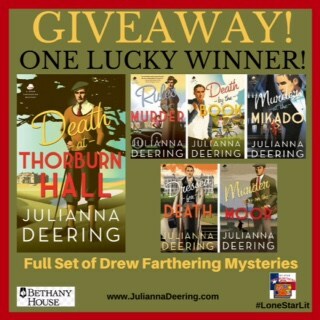 I once had a review that said, “If Bertie Wooster and Jessica Fletcher had a love child, it would be Drew Farthering.” I love that quote. It’s hysterical and it’s absolutely true! So, if you’d like to trace Drew back to his entertainment roots, here are the most influential ones. 1. First and foremost and without a close second would be the works of Dame Agatha Christie. 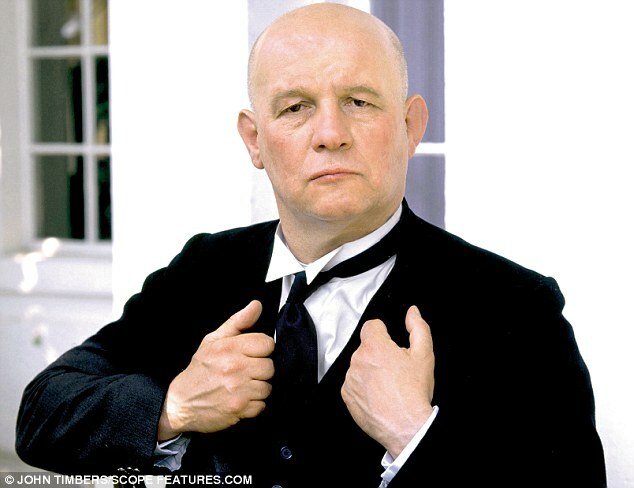 And first and foremost of these would be the delightful cases of Hercules Poirot. The books are wonderful, thought-provoking reads, and the inestimable David Suchet portrays him on television with humor, warmth, intelligence, and absolute perfection. 2. 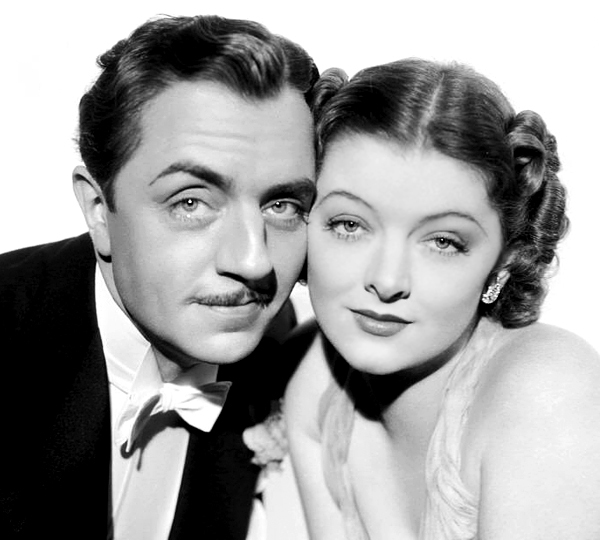 A huge influence on the relationship between Drew and his beloved Madeline was the Thin Man series of movies starring William Powell and Myrna Loy (beginning in 1934). They are a loving married couple who obviously enjoy each other’s company along with solving mysteries. The snappy banter between them is always a delight. 3. 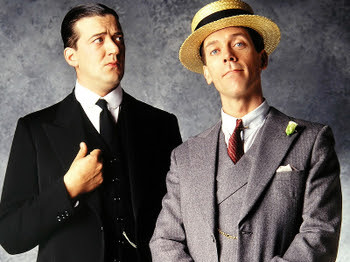 P. G. Wodehouse’s hysterical Jeeves and Wooster, impeccably portrayed by Stephen Fry and Hugh Laurie, had a definite impact on Drew’s sense of humor (and mine). The books and the television series are both well worth checking out. 4. Albert Campion, the mild-mannered sleuth created by Margery Allingham, was a delightful surprise to me when I discovered him several years ago. I had never heard of this series (shame on me! ), but I absolutely devoured it once it came to my attention. 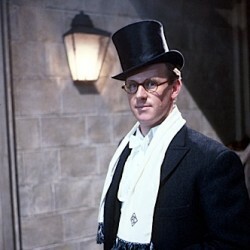 Allingham’s plots fit together like fine watchworks, and the television adaptation starring Peter Davison is brilliant. Brian Glover as his hardboiled valet (he was a cat burglar until he lost his figure) alone is worth the price of admission. 5. Agatha Christie’s And Then There Were None might be the most perfectly plotted mystery ever written. Unfortunately, I saw the 1945 film version before I read the book, so I didn’t get the joy of reading the story without already knowing the solution. It would certainly take a cleverer person than I am to read that book, having no knowledge of it beforehand, and be able to solve the mystery. 6. 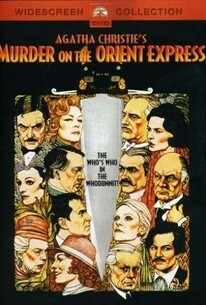 I can never decide if And Then There Were None or Murder on the Orient Express is my favorite of Christie’s works. Again, if I hadn’t seen the 1974 film version of this story, I would have loved to try to solve the case as presented in the book. As with ATTWN, the plot is meticulously crafted. I’m not sure why the script writer for the 2017 film version found it necessary to make so many changes to the story and to the characters. 7. Drew and Madeline’s relationship owes much to the romantic comedies of the 1930s. 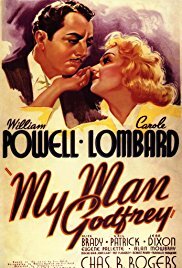 One of the greatest of these is My Man Godfrey, also starring the dapper William Powell as a blueblood who’s dropped out of society and who, quite by accident, becomes a butler in a rich but troubled home. It’s a screwball comedy with a warm heart, and it definitely inspired a character or two in Drew’s most recent adventure. 8. 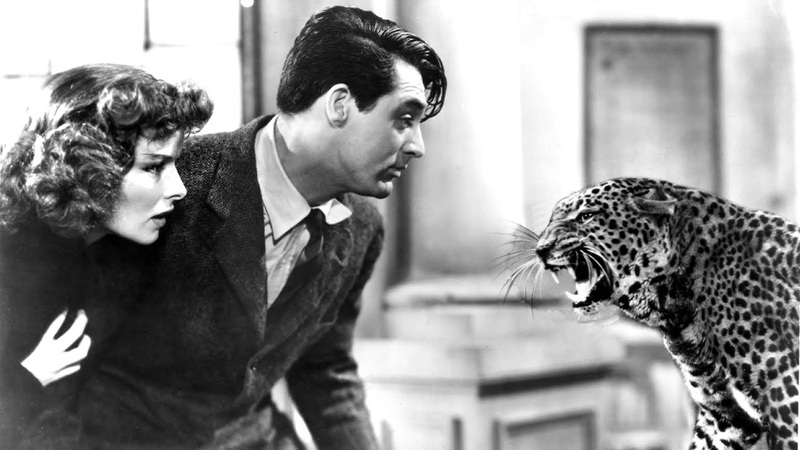 Another of the great romantic comedies of the ‘30s is Bringing Up Baby. Cary Grant and Katherine Hepburn are hilarious as a mild-mannered archeologist and the ditzy society girl who is determined to make him see they’re perfect for each other. 9. 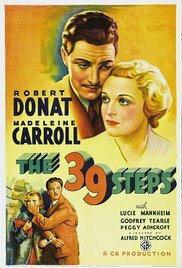 One of Alfred Hitchcock’s early movies is the 1939 version of The 39 Steps. It features Robert Donat as an innocent man on the run from a ring of spies and, being one of Hitchcock’s, the film has plenty of suspense as well as romance and ironic humor. 10. Last but certainly not least is Dorothy L. Sayers’ Lord Peter Wimsey. Lord Peter’s adventures, besides being fabulously entertaining, provide an excellent and intelligent look into the life of a British aristocrat and the mysteries are always a challenge to solve. 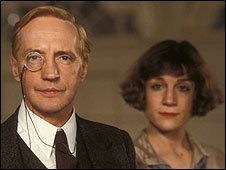 I’m sorry the television series with Edward Petherbridge covered only three of Sayers’ novels. So there you have it, the ten things that most influenced the creation of Drew Farthering and his adventures. 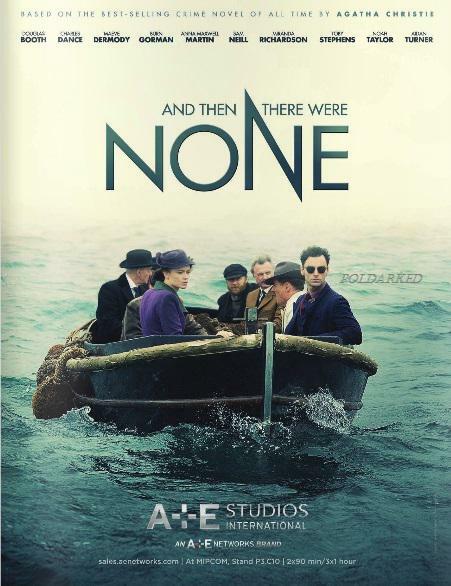 I have to commend the BBC for making such lushly beautiful television series for so many classic mysteries. More than just reading the books that inspired them, these series let me see and hear England of the 1930s. Similarly, movies made in America during the 30s let me see and hear what that time was like. They and the books of that time period have all inspired my series as well as British Drew and American Madeline. love love love. I could watch all those shows over and over (and I do!) And I'm so glad you were inspired to bring us Drew! Congratulations on such a well-loved series!